With a dimunitive name (the "ito"), Mercadito was not a dollhouse-size storefront with even smaller interior. Quite the opposite. The unpretencious entrance doors gave way to a chic market. Yes, upholstered bench seats meet decorative weaved basket-light fixtures dangling from the ceiling. And the bar was even more impressive. The restaurant was large and must hold over 70 people. The waitress that served us shared that famed pop singer Shakira, was recently here. Scanning the various "guacamoles" as a starter, we opted for the traditional one with avocado versus the more adventurous flavors of pumpkin or pomegranate. It was perfect! Lately I have been sampling ceviches from different restaurants. More recently I had the ceviche at the famous Joe's Stone Crab restaurant in South Beach. It was disappointing. They were clearly missing an ingredient but I could not pin point it. After a long work day, I needed an uplifting evening. Please, Poseidon, don't fail me! So next, I ordered a fish ceviche "dorado" which consisted of mahi-mahi, avocado, tomato, and orange-chile de arbol broth. No fishy taste, light, not too tangy and refreshing. I loved it. 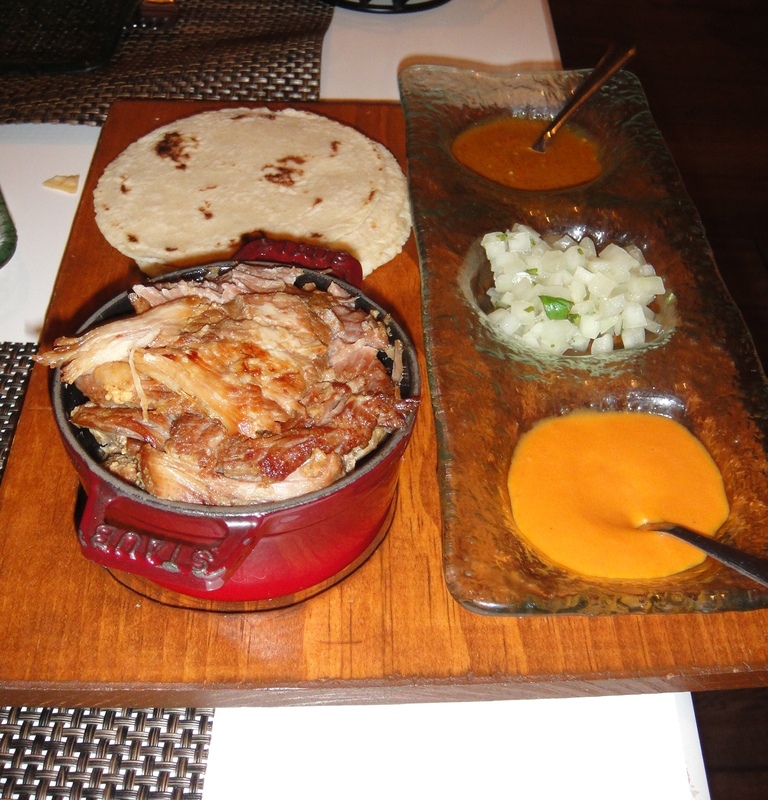 For my choice of meat, my taste buds leapt at the "carnitas de puerco" taquizas. Translation: braised pork flour tacos. The dish, to my surprised was an appetizer size. However, the meat was flavorful, succulent and the three sauces enhanced the flavors with a mild or bold flavor. I skipped the tortillas that accompanied the pork. I was already brimming carbs from chips and guacamole. Passing up dessert was quickly negated when the dessert menu was presented and the first item "flan de cajeta" cried my name. A lover of goat's cheese, I was drawn by the ingredients of goat's milk, orange crystallized topping and dusted coffee. High marks for the food flavors, it met or exceeded expectations. Unfortunately I give low marks for value. The pork carnitas was priced at $21. Highly overpriced. Mercadito is definitely out of my moderate-priced budget. For indulgence, I would rather go to Michael's Genuine Food or Asia de Cuba at the Mondrian. The trend of loud music was rampant at Mercadito that once again I felt I was 42 years old going on 80. As a marketing professional I see that restaurants are excluding an older clientele with money to spend. By reducing the music volume that still exudes ambiance but does not overpower the sensitivities of clients, should be the goal.